The Founder Feature Series for the 5th Cohort of The Mentor Network keeps up its momentum! In this series, we chat with our founders to learn more about them as individuals, as well as their entrepreneurial journeys. They have some great wisdom and experience to share with the rest of the community! So let’s hear what wisdom Luke has to share below! What did you do before you were the Founder of your startup? Why this startup? A.k.a. what is your ‘why’? Fun, Family and Freedom. My company offers fun to the masses while treating everyone like family and giving freedom to be yourself, have fun, meet others and explore the community. What was your first milestone/win that let you know that you were on the right track to build this business? Being able to leave my full time job to work for myself full time after 3 years. Why did The Mentor Network stand out to you as a positive program to be involved with? Because I’ve been doing this on my own for so long and often desire validation or feedback on my ideas and business. How do you maintain sanity in this crazy, insane startup world? Making time for myself and family. I schedule workouts, meditation, walks and other fun with myself, family and friends. When you love your job it’s easy to let it take over and work all the time. It’s important to make time to enjoy life. KC has so many resources and people to help entrepreneurs. What are we still missing? What gaps do you think we need to fill? Increased collision density. I feel there are a lot of founders out there grinding it out but aren’t often in the same circles as others that are doing the same. Regarding the KC startup ecosystem, what has been your favorite service/resource that you would like to share with other founders to take advantage of? If you could go back to the day you started this journey and give yourself one piece of advice what would it be? Start reading and learning more NOW! 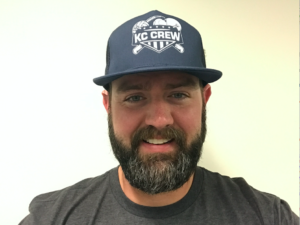 Keep an eye out for more announcements from Luke, as he’s in negotiations with the City of Overland Park to launch KC Crew South and take over all the Overland Park leagues next year! He’s also working with Dave & Buster’s on a national partnership for their league software and management.